Pune, January 19: Manipur’s Tingmila Doungel was just another 11-year old in Imphal who was going through the routines of a simple life until she watched a movie one evening that was set to change her life. The movie was a biopic on Manipur’s favourite daughter, MC Mary Kom. Tingmila found a role model and decided on that very night that she wanted to follow in the footsteps of Mary Kom whose story inspired her in many ways. At that moment, she could relate strongly to her idol who also faced something similar at the beginning of her journey. 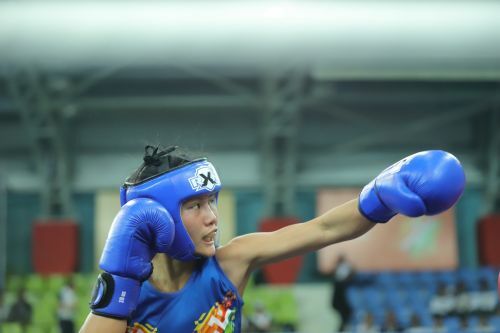 Just like Mary Kom, Tingmila firmly stood her ground and was adamant on pursuing the sport as she soon joined an academy in Imphal in 2015 to learn the sport. She won a medal at a state-level tournament in the same year after which there was no looking behind for Tingmila. She then participated in numerous tournaments in a short span as her coaches were impressed with her dedication, and she found support from her family as well. She was soon spotted by scouters from Mary Kom’s academy in Manipur who then took up the responsibility of training her. She still vividly remembers her first meeting with Mary Kom and calls it a moment that is ‘impossible to forget’. “Mary ma’am has always supported me and meets me every time she visits the academy. I learn something new from every interaction and I feed on such valuable pieces of advice,” says Tingmila as she speaks very highly of her mentor. Her big moment came at the Silesian Boxing Championship in Poland in 2018, where she won gold. It was a big day for her and Mary Kom’s ring-side presence made it better. Interestingly, Mary Kom won gold in the senior category at the same event. Tingmila has bagged a silver medal in the U-17 48 kg category at the ongoing Khelo India Youth Games. She earned the silver medal at the Khelo India School Games last year as well. “She was very happy with my performance at KISG last year and was quick to point out what I needed to improve on which helped a lot. I still haven’t had the chance to speak to her after winning a medal this time and I’m sure she will have good things to say when I do,” added Tingmila, ecstatic after a good performance." From starting her journey after taking inspiration from a biopic to winning gold at the same tournament as her mentor, Tingmila has come a long way and hopes to go all the way in her quest for international glory.